The Central Ohio franchise group for Papa John’s, which was awarded the company’s prestigious title of 2010 Franchisee of the Year in March, recently remodeled 17 of their 22 locations. The Johncol team continues to do an outstanding job of delivering on the “Better Ingredients, Better Pizza” brand promise and the recent remodels are an example of their commitment to the brand. The new restaurant lobby enhancements are simple, clean, inviting and deliver the brand personality and promise through signature elements which include a very appealing red and grey color scheme. 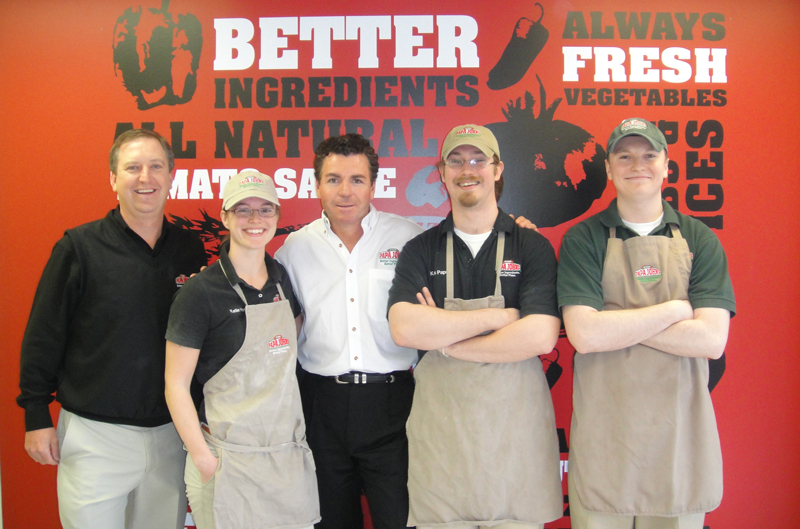 On a recent trip to Columbus, Papa John’s Founder, John Schnatter, toured some of the remodeled stores and recognized Johncol’s commitment to the brand. The Johncol team was the first franchise team in the country to complete a remodel of this scale. Papa John’s founder John Schnatter is in the house! Papa John’s Founder, John Schnatter, and his entire executive team joined the Central Ohio franchise group for Papa John’s at the Ohio State RPAC for their quarterly team meeting on April 18, 2011. The Johncol team was recently awarded the company’s prestigious title of 2010 Franchisee of the Year. This is the second trip to Columbus for Papa John Schnatter who recently toured some of the remodeled stores and recognized Johncol’s commitment to the brand.